Why do you not want it anymore? Why a PC laptop instead? Rare instance in which a piece of audio/video software actually has an equal or better version for the PC. Would love to take that Powerbook off your hands as I'm kinda stuck in the same situation. Currently running Adobe Audition 1.5 on a Dell laptop since my company paid for the software with the stipulation that it run on existing equipment. 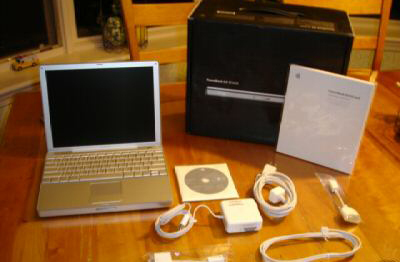 Would rather have ProTools on a Mac...but even a used Powerbook (plus the cost of ProTools!) is just a little out of my budget right now. A nice high-end pc laptop would be a nice trade.. I run Logic Audio on my PowerMac g4 and I wondered if you had any problems with your laptop and recording. dropped samples, sluggish performance, etc. anything like that? I want to switch to a laptop-based studio, and I don't want to get burned.